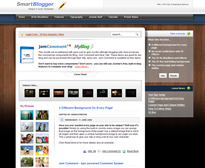 Shape 5 have released a theme aimed at bloggers and users of Joomla. We all know Joomla doesn't offer the more traditional look and feel that someone that blogs will be used to, but what you get with Joomla is the development community and this time, Shape 5 have teamed up with Azrul, to demonstrate how a theme will look with their comment and blog components. On very first glance, I really like how the integration with the blogging component looks and I'm keen to have a look at how it works on Azrul. Another nice feature I've just seen is the ability to create as many different background images as you want and assign them to specific pages via the menu system. Especially now, as I think quite a few come with the theme! If you want to see it live, click here, but you're not going to be disappointed with Shape 5. Have a different background on every page! Jom Comment and Google Video Ready!